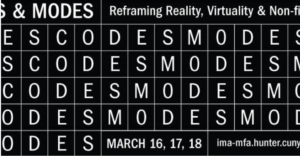 The Hunter Integrated Media Arts MFA Program is sponsoring Codes + Modes: Reframing Reality, Virtuality and Non-fiction Media. I’ve been working hard with colleagues Andrew Demirjian and Heidi Boisvert (NYC College of Technology) on what should be an exciting event. Join us for a stellar line up of curated talks, panels & a performance & art exhibition that aim to create an intervention into the often uncritical excitement about virtual reality, augmented reality, artificial intelligence and machine learning to establish a space for conversations about long-term socio-cultural and neurobiological impacts. Presenters will discuss how theorists, activists and artists can develop useful frameworks to explore the complex implications of using emerging technologies. Featured speakers include Lev Manovich(Director of the Cultural Analytics Lab, CUNY Grad Center), Mandy Rose (Co-Director of i-Docs), Daanish Masood (Co-Founder BeAnotherLab), and Lina Srivastava (Founder of Creative Impact & Experience Lab), Dan Archer(Founder of Empathetic Media) and Geetu Ambwani (Principal Data Scientist at Huffington Post).